The LB&SCR or 'The Brighton' as it was more popularly known came into existence in 1846 with the merger of several small early railway companies. In time it developed a network bounded to the West by Portsmouth and Guildford, to the East by Tunbridge Wells and Hastings, and stretching from London South to the sea. Our product range covers a variety of four and six wheel coaches from the LB&SCR period many of which survived, in one form or another into Southern railway days. If you are interested in the LB&SCR and its coaches then you may be interested in the Brighton Circle, a society founded to collect and publish information on the LB&SCR and its constituents. Several surviving LB&SCR coaches remain at the Bluebell railway and at least one is in service. The Stroudley four wheelers were introduced in 1872 when William Stroudley took over the Brighton works. They represent the beginnings of standardisation on the LB&SCR. Two versions of the coaches were built, close coupled suburban coaches with long windows and low compartment dividers (below the window), and buffered coaches with quarter lights. These were still quite close coupled having longer buffers on the brake ends only. By WWI the coaches were primarily relegated to workmen's trains and excursions. A small number survived however on the Isle of Wight running as the four car rake in the kit (with one compartment of the first re-classed as third) and on the mainland until 1935 in the Lancing Works train. These four wheel coach kits are etched body kits that model the normal buffered coaches. 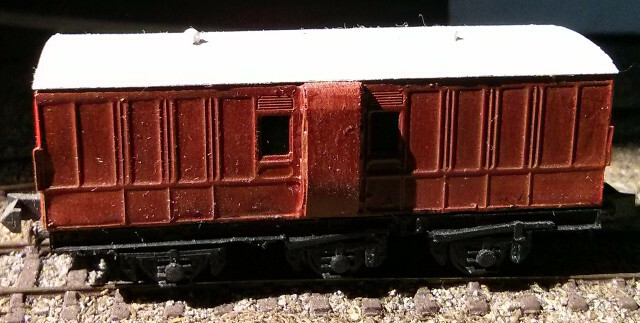 An experienced modeller can file out the window dividers to model the suburban stock. Each of the kits consists of a fold up etched body shell and a separate roof. The roof has been marked so it can easily be drilled for differing lamp configurations. The brakes have additional parts for the guards duckets and ends. This kit produces a 26ft. four wheel composite coach from 1874 which fits on a 15' wheelbase Peco wagon chassis with most brake gear removed (not included). Individual Stroudley first coach body kit to expand the Stroudley coach set (LBS02). Requires a 15' wheelbase peco wagon chassis (not included). This body design is also correct for the mainline second. 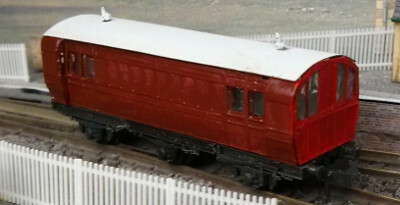 Individual Stroudley third coach body kit to expand the Stroudley coach set (LBS02). Requires a 15' wheelbase peco wagon chassis (not included). This body design is also correct for the suburban second. This kit provides a fold up body shell and roof for a Stroudley 20ft four wheel full brake, as well as duckets. It is designed to fit a modified peco wagon chassis. These kits produce six wheel Stroudley era coaches. A pair of Peco 15ft chassis are used. These need to be sawn up and fitted together to form the underframe. Stroudley designed a 28ft4 six wheel first class coach to complement the four wheelers. This kit contains a fold up body shell and roof for the six wheel first designed to fit a pair of modified peco wagon chassis. This kit provides a fold up body shell and roof for a Stroudley 26ft six wheel full brake, as well as fold up duckets. It is designed to fit a 15ft wheelbase peco wagon chassis with an extra axle spliced into it from another wagon chassis. This kit provides a fold up body shell and roof for the Stroudley 30ft composite coach with lavatory. It is designed to fit a pair of modified peco wagon chassis. This is a special order item, please allow two to three weeks for delivery. Twenty four wheel overlay etches to turn Peco wheels into Mansell type wheels. Ian White decals for the LB&SCR coaches. Contains sufficient guard, first, second, third and garter marks to decal the four coach set and a composite. Members of The Brighton Circle should order direct from Ian for a better price. Robert Billinton took over from William Stroudley in 1890. His coach designs continued the Stroudley style but with a much higher roof line and some other detail differences. The higher roof line gave turn of the century LB&SCR trains their distinctive 'mixed height' appearance. The coaches would have been oil lit until the early 1900s and then progressively were moved to electric light. Many of these coaches lasted until Southern Railway days. These kits follow the same basic design as the Stroudley kits, and consist of the same style of fold up 'box' and separate roof. The roof is marked out for ventilators which can be purchased or produced using round headed pins. Constructed to the same basic method as the six wheel Stroudley coaches they provide an easy way to produce six wheel coaches. This kit provides a fold up body shell and roof for a Billinton six wheel first. It is designed to fit a 15ft wheelbase peco wagon chassis with an extra section spliced into it from a second Peco wagon chassis. This kit provides a fold up body shell and roof for a Billinton six wheel second. It is designed to fit a 15ft wheelbase peco wagon chassis with an extra section spliced into it from a second Peco wagon chassis. This kit provides a fold up body shell and roof for a Billinton six wheel third. It is designed to fit a 15ft wheelbase peco wagon chassis with an extra section spliced into it from a second Peco wagon chassis. This kit provides a fold up body shell and roof for a Billinton six wheel brake second to diagram 73/163 (the style without duckets). It is designed to fit a 15ft wheelbase peco wagon chassis with an extra section spliced into it from a second Peco wagon chassis. This kit provides a fold up body shell and roof for a Billinton six wheel full brake including duckets. It is designed to fit a 15ft wheelbase peco wagon chassis with an extra section spliced into it from a second Peco wagon chassis. This kit provides a fold up body shell and roof for a Billinton six wheel brake second including duckets. It is designed to fit a 15ft wheelbase peco wagon chassis with an extra section spliced into it from a second Peco wagon chassis. This kit provides a fold up body shell and roof for a Billinton six wheel brake third including duckets. It is designed to fit a 15ft wheelbase peco wagon chassis with an extra section spliced into it from a second Peco wagon chassis. This kit provides a fold up body shell and roof for a Billinton six wheel double ended brake. It is designed to fit a 15ft wheelbase peco wagon chassis with an extra section spliced into it from a second Peco wagon chassis. In 1905 the LB&SCR experimented with a pair of petrol electric rail-motors to cut the costs on small branch lines. This was followed by some steam rail-motor experiments. 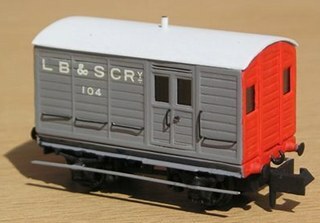 The LB&SCR settled on single coach auto-trailers which could be used with existing small locomotives (the 'Terrier's). These coaches had basic controls at one end which permitted the train to be driven from either the trailer end or the locomotive, avoiding the need to run around the train. The large coaches combined with the small locomotive earned them the nickname of 'balloon' trailers. The kit includes a fold up etched shell and additional overlays, metal roof profile, plastic ventilators, white metal underframe parts, glazing material and oval buffers. You will need to provide a pair of bogies. 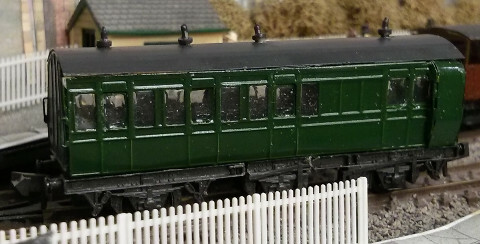 Currently the bogie style used by these coaches is not available in N gauge but a reasonable approximation can be made using Farish DMU bogies (available from BR Lines). Some of the parts to this kit are quite delicate because of the large windows and narrow frames in the design. You will need bending bars to shape the coach and should probably have built some simpler coaches before attempting these. Three series of Balloon trailers were produced to the same design as the Marsh/Panter coaches. Their distinctive high roof and shape dwarfing the 'Terrier' tank engines often used with them. This kit represents the later design to diagram 180. 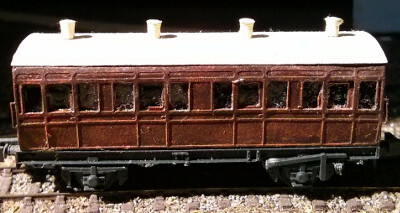 Using our 'Ultima Pro' construction of 3D printed shells and compartments with etched overlays and details these kits reproduce the mainline Balloon coaching stock introduced during Marsh's brief tenure. The kits consists of a 3D printed body shell, compartment dividers, and gas lamp tops, etched trussing, etched and white metal underframe parts and etched glue on sides. Bogie mounts are printed into the shell and can fit the recommended Fox pattern bogie (UM578) or any other bogies following the standard UK pattern mount. Diagram 190 54ft Brake Third. A small range of kits for LB&SCR wagons. Most of these survived into Southern days and some into British Rail. 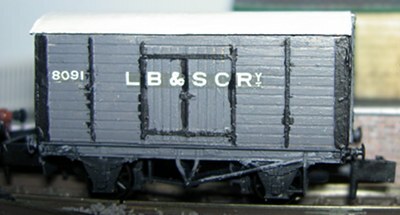 Some LB&SCR wagon decals are available from Fox Transfers. The kits consists of a fold up body shell, roof and overlays for the planked sides all in 6thou brass to get high detail. You will also need a small bit of round rod and some square plastic strip to produce the end struts. Body kit for a Stroudley Goods Brake Van of 1882. Designed to fit a modified Peco 10' wheelbase brake van chassis, or a peco 9' wheelbase chassis (not supplied). This kit represents the later incarnation of the van after the birdcage was removed. The picture shows Gareth Collier's prize winning build of the van. The kit consists of a fold up body shell, roof and overlays for the planked sides all in 6thou brass to get high detail. You will also need a small funnel and some plastic rod to produce the end struts. Body kit for a Stroudley Goods Van to diagram 8 (Southern diagram 1433). Designed to fit a Peco 10' wheelbase chassis. This kit represents the 7ft radius roof versions of the van. Body kit for a Stroudley Goods Van to diagram 8 (Southern diagram 1433) as a poultry van. Designed to fit a Peco 10' wheelbase chassis. This kit represents the 7ft radius roof versions of the van. Kit for an LB&SCR 7' wheelbase three plank ballast wagon. The kit includes body, chassis, detail overlays and brake detailing. 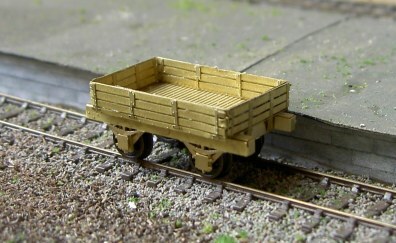 Because of the small size of these wagons you will also need to use 2mm Scale Association 12.25mm axle wheels (either for N scale or 2mm fine scale) and bearings (not included). This is a special order item - please allow two to three weeks for delivery.